Courtney Turrin and I arrive on the Benjamin Harrison Bridge over the James River near Hopewell Virginia just after 7:15 AM. A call to the tenders closes the bridge just long enough for us to unload gear in the control tower. 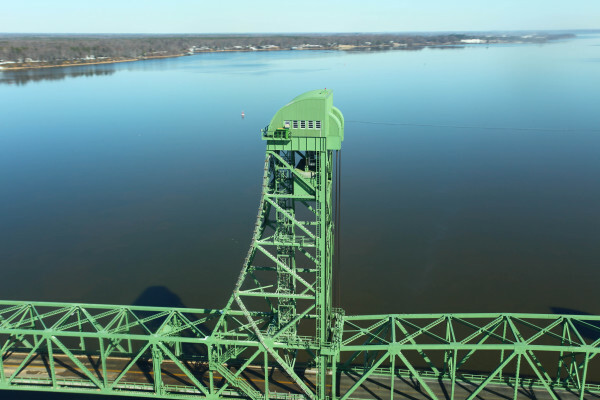 The historic draw bridge has massive twin lift towers that rise more than 300 feet above the water. We carry gear to the north tower landing and attempt to call the cable elevator with no success. Rain the night before had shorted the elevator, so we prepare additional gear for the long climb up the outer ladders to reach the upper catwalk and the falcon nest box that The Center for Conservation Biology (CCB) installed in the late 1990s. Halfway up the ladder, the adult peregrines begin to wail and stoop. North lift tower of the Benjamin Harrison Bridge. Nest box is visible on the catwalk. Photo by Bryan Watts. Click to hear Yellow and sibling calling within the lift tower of the Benjamin Harrison Bridge. Recording by Bryan Watts. As we reach the top of the lift tower, Libby Mojica, 50 miles to the north, meets up with a crew from the Virginia Department of Transportation (VDOT) near the base of the Norris Bridge across the Rappahannock River. Included in the group is environmental specialist Theresa Tabulenas, an entire snooper truck crew, a traffic control crew, administrators, and local reporters. 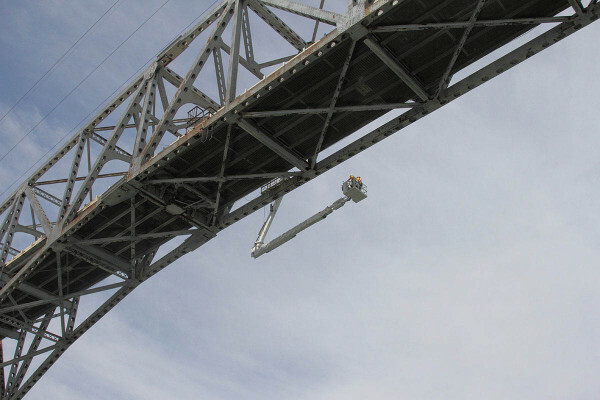 Before the convoy begins to move onto the bridge, Bart Paxton launches a boat and takes a position under the bridge in case a young falcon attempts its first flight. The pair of falcons on the Norris Bridge nest on a beam directly under the roadbed and more than 100 feet above the water. A specialized snooper truck with a boom capable of extending out and curling up under the bridge is the only possible access to the nest. Once in place, Libby, Theresa, and a truck operator climb inside the small bucket and begin the carnival ride out over the river. Just as they are retrieving the brood, Courtney and I have arrived back in Williamsburg. Marie Pitts and Courtney band the two young peregrines and place a strip of colored tape on one of the bands on each bird to make it easier for hack attendants to identify the birds on the wing. Libby Mojica and Theresa Tabulenas in snooper truck maneuvering under the Norris Bridge to reach peregrine brood. Photo by Bart Paxton. Photo by Bart Paxton. 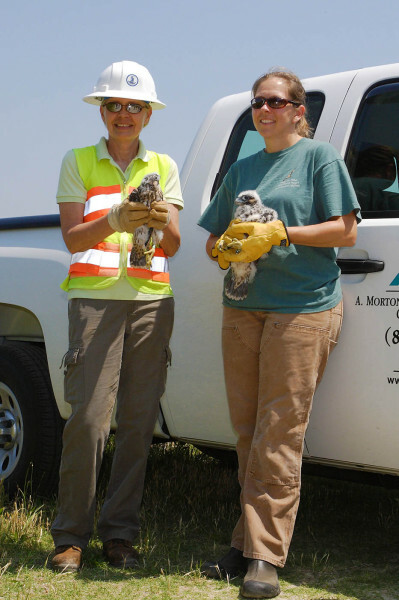 Theresa Tabulenas (left) and Libby Mojica (right) with peregrine brood from the Norris Bridge. Photo by Bart Paxton. As Libby concludes the banding event in a parking lot near the Norris Bridge, Jake McClain, a student intern at CCB, begins to prepare a vehicle to transport the peregrines west. Jake and Ashley Lohr, a biology student attending Virginia Tech and summer intern for Shenandoah National Park, will meet half way between Williamsburg and Shenandoah to transfer the birds and Ashley will drive the birds to the park. Libby arrives in Williamsburg in the early afternoon, handing off the birds to Jake.Ashley will have the brids in their hack box by early evening. Courtney Turrin (right) and Marie Pitts (left) band yellow outside the CCB office in Williamsburg. Photo by Bryan Watts. 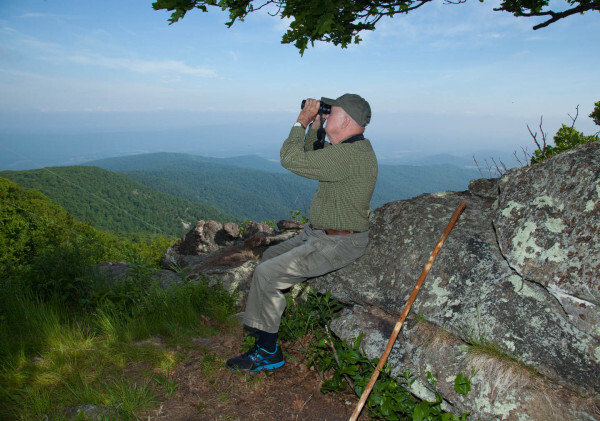 Rolf Gubler, a biologist with Shenandoah National Park and an expert at managing peregrine releases, has been preparing for the hack. Weeks before the transfer of birds, Rolf and Sergio Harding from the Virginia Department of Game & Inland Fisheries secured a seasons supply of captive-reared quail to feed the peregrines. A week before, Rolf had taken the two custom-made hack boxes from storage and put them in place on Hogback Mountain in the park. Rolf and Ashley place the birds in the boxes upon arrival and the birds are fed daily until ready for release at fledging age. 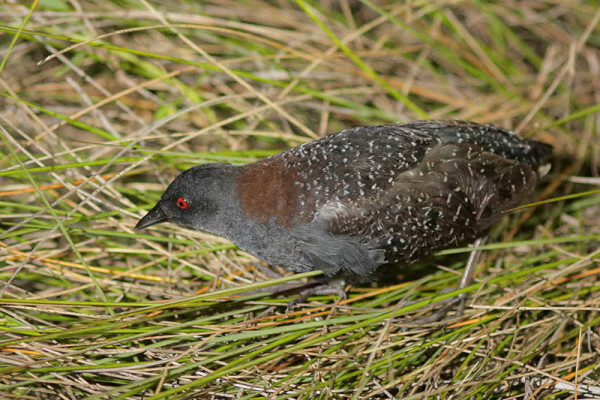 After release from the box, the birds continue to be fed until they learn to hunt on their own and disperse from the site. 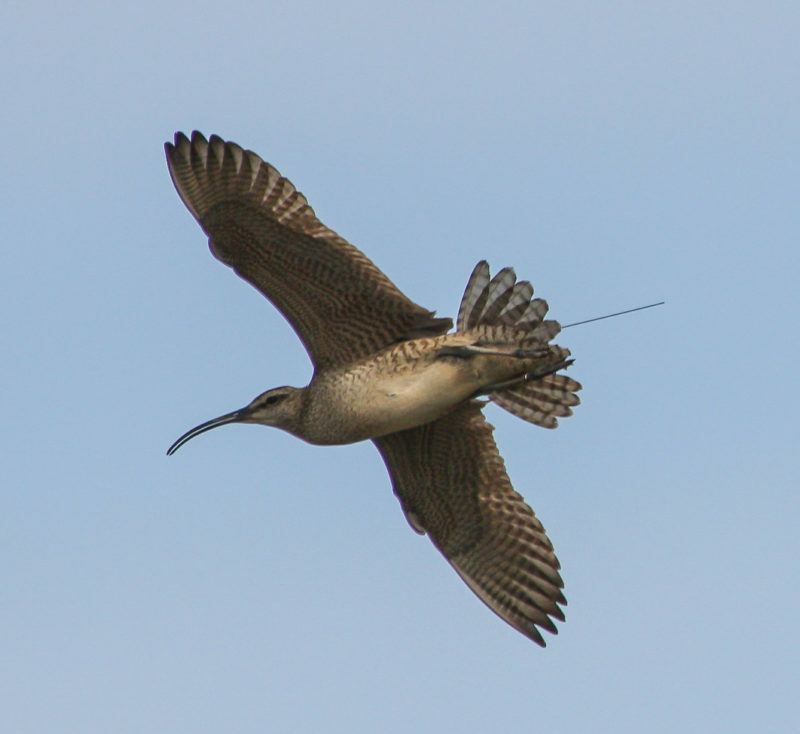 Three different cohorts of birds are brought to the site for release over the course of the breeding season. 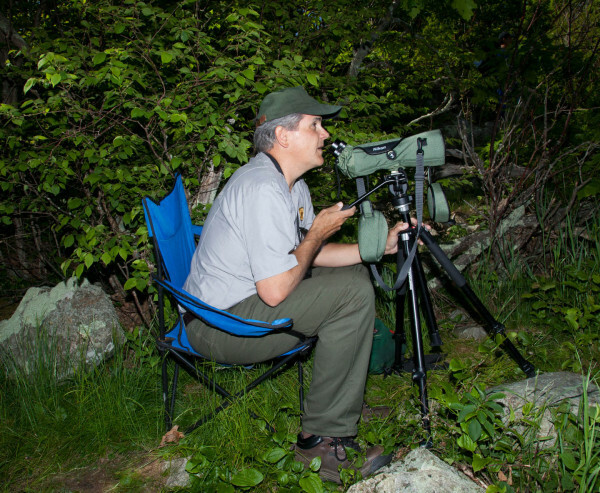 Rolf Gubler using a spotting scope to identify individual peregrines within the Hogback Mountain hack site. Photo by Bryan Watts. During the several-weeks-long transition to independence, Rolf and Ashley monitor the birds daily, keeping a log of each individual’s presence and activity. 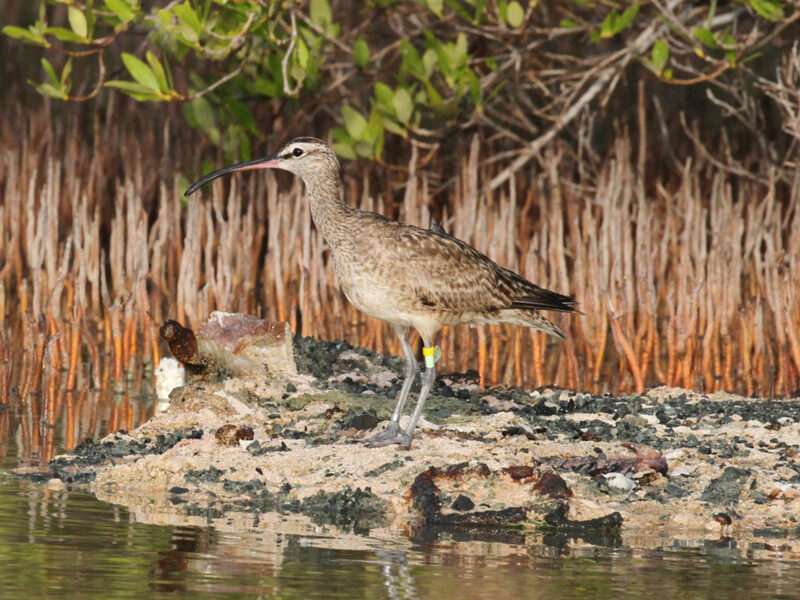 The colored tape placed on the bands facilitates the identification of each bird. 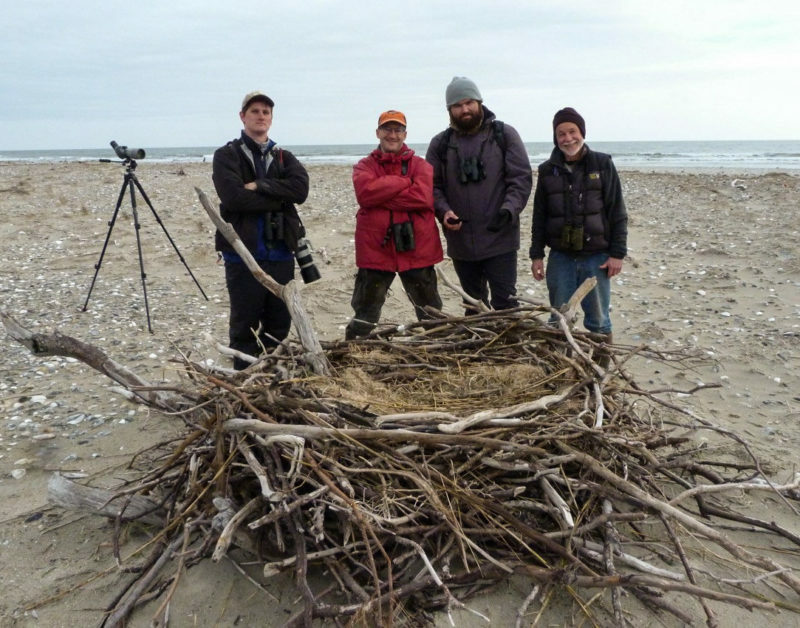 Mitchell Byrd and I visited the hack site with Rolf and Ashley during the last release of the season. 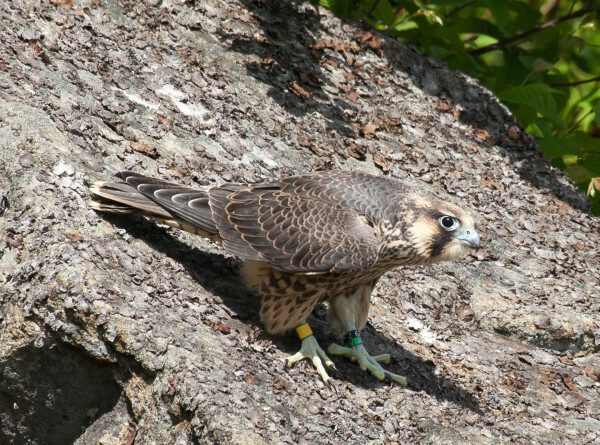 Mitchell is the great grandfather of peregrine reintroduction in Virginia, having started the release of captive-reared birds back in 1978. On this day, we were both treated to the sight of 8 young falcons on the wing coming and going to feed and whirling out over the valley below. Standing out among the birds was yellow, the bird that Courtney and I had taken from the Benjamin Harrison Bridge earlier in the season. Mitchell Byrd perched on a rock at Hogback Mountain hack site watching the spectacle of peregrines on the wing. Photo by Bryan Watts. Yellow perches on a rock just below the hackbox on Hogback Mountain within Shenandoah National Park. Once on the wing, birds come and go to the feeding station throughout the day. Photo by Bryan Watts. Since the 2000 breeding season, we have translocated 235 young falcons produced by coastal pairs to the mountains for release. 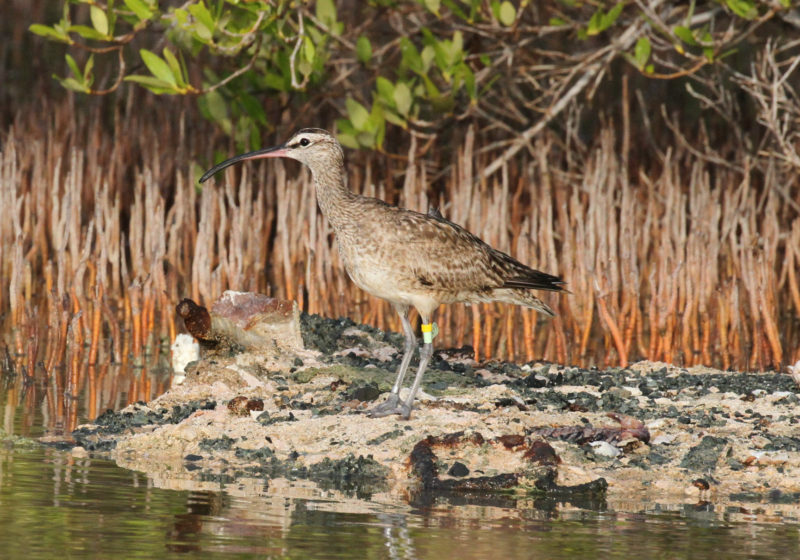 Translocation has been part of an integrated restoration program. 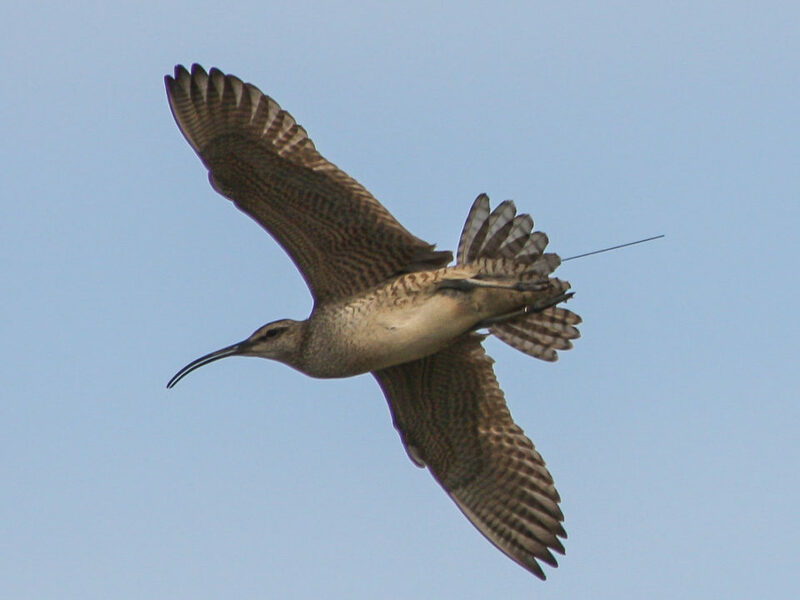 Moving the young from the mountains increases the survival of young hatched on bridges and buildings where mortality is notoriously high, reduces the impact on migratory shorebirds, and provides the opportunity to strengthen the mountain population. 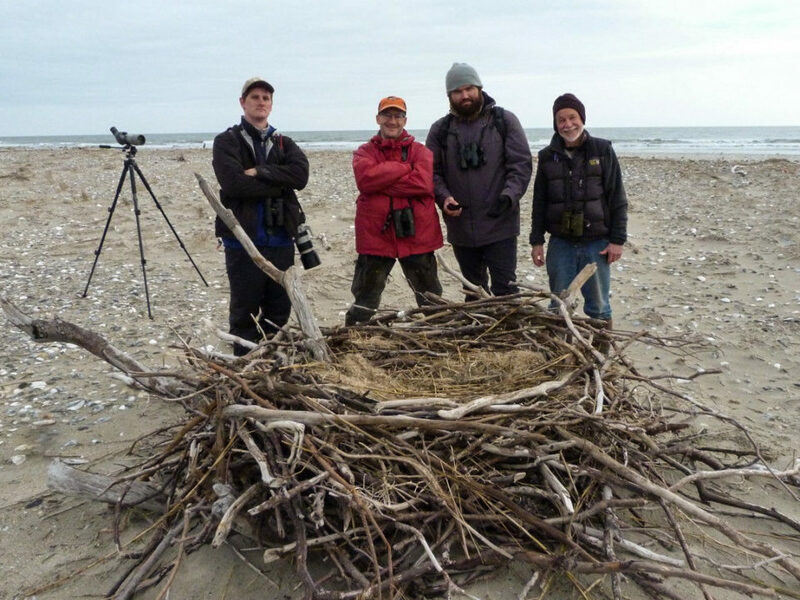 The translocation program has many moving parts and would not be possible without a team effort. We thank all of the agencies and individuals who are committed to peregrine conservation and who make the effort possible. 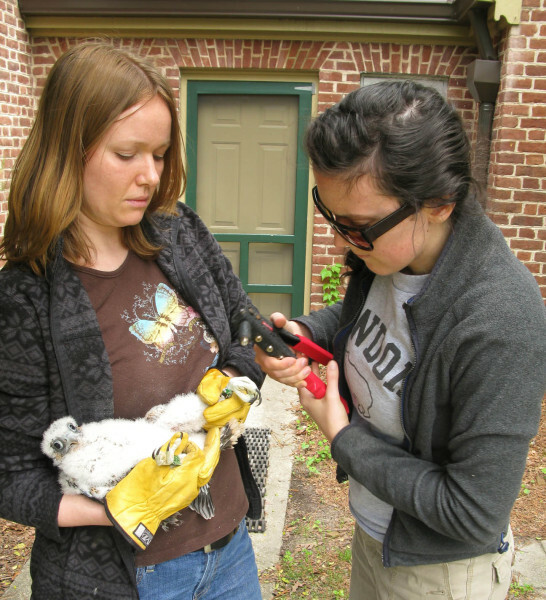 Learn more about CCB’s peregrine falcon breeding population monitoring and management in Virginia.